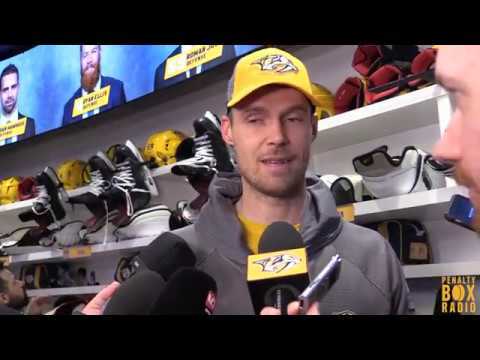 Although the Nashville Predators were still not mathematically eliminated from playoff contention, they knew that the Washington Capitals were in the thick of the Eastern Conference Wild Card race coming into Sunday night’s tilt at Bridgestone Arena. Nashville had been playing fairly strong lately, despite the game against Dallas on Friday night, and they knew that it would take a detailed game to slow down power-house players like Nicklas Backstrom and Alex Ovechkin. The Predators were able to dominate in five-on-five play and get only their second shootout victory of the season, winning 4-3. Shea Weber speaks with the media following the game and full recap below. It didn’t take long for both teams to get on the board in the first period. Just 4:17 into the first period, Mike Fisher turned the puck over in front of the the Nashville net. Troy Brouwer, after receiving the puck from Mike Green and Nicklas Backstrom, netted his 22nd of the season. Less than two minutes later, Fisher made up for his earlier mistake by winning an offensive zone face off back to Shea Weber. Weber shot the puck, which then rebounded off of goaltender Jaroslav Halak. Patric Hornqvist then picked up the rebound and shot it past Halak for his 16th goal of the season and 100th of his career. Fans in attendance Sunday night got their money’s worth early and often. At 8:16, Rich Clune and Patrick Wey had business to attend to near the offensive zone blue line. This was easily the best fight of Clune’s career. After landing multiple punches, Clune tallied the knock out with a vicious upper cut, sending Wey to the ice. Washington was given a power play opportunity at 12:20 when Patric Hornqvist was called for holding Nicklas Backstrom. The Predators were able to kill off the penalty while youngster Colton Sissons and recent call-up Mark Van Guilder earned some playing time on the penalty kill. The home crowd absolutely lit up late in the first period up when Patric Hornqvist took advantage of a Capitals turnover and scored for the second time in the game. Hornqvist streaked in and faked out Halak by going forehand-backhand-forehand and then roofed it in for his 17th of the season at 18:30. At the end of the first period, Nashville led 2-1 on the scoreboard and 11-7 in shots while playing fairly smart hockey and capitalizing on chances. Play continued through half of the second period until each team took minor penalties, opening the ice for four-on-four play. At 8:14, Ryan Ellis took a holding penalty and Tom Wilson took a slashing penalty. Neither team scored during the time with open ice even Patric Hornqvist though was extremely close to netting his hat-trick goal, but Jaroslav Halak was up to task, making a tremendous glove save on the breakaway. The Predators took a gamble by putting the number one power play on the ice when they went on the penalty kill two times in a row. Nashville killed off the first penalty for too many men on the ice by having one forward spy Alex Ovechkin the entire time he was out for the power play. Immediately following a successful penalty kill, Roman Josi took an interference penalty and at 14:22 of the second, Troy Brouwer notched his second goal of the night from Marcus Johansson and Nicklas Backstrom. After a fairly evenly played second period, the teams went into the second intermission tied at 2-2 with the Predators leading in shots 19-16. It took a few minutes for the teams to warm up in the third period, but Nashville retook the lead in excellent fashion. With Cullen zooming in, he passed the puck to Mike Fisher, who then left a drop-pass for Shea Weber. Weber then blasted the puck past Halak for his 21st of the season at 8:23. The Predators once again put the Capitals on the power play and it did not fair well for them. The best power play in the league responded in turn. At 12:20 of the third, Nicklas Backstrom tallied his third point of the night and 14th goal of the season with a nasty snipe from the face off circle, putting it past goaltender Carter Hutton. With the score remaining tied throughout the rest of the third, the teams would go to overtime to battle over the much-need point, especially for the Capitals. Except for a shot ringing off the post for Dmitry Orlov, neither team had quality scoring changes and the game went to the shootout. It only took one goal, by Craig Smith, for the Predators to seal the victory in the shootout, winning 4-3. Below are the shooters and the results. Below is post game reaction from Matt Cullen and head coach Barry Trotz.